Oh Wanaka, how could we have skipped you on our first trip to New Zealand a few years back? No idea what got into us, but luckily we did not make the same mistake twice and enjoyed a few days in Wanaka this time. What can we say? This cozy place on the South Island had us enraptured from the first moment. Granted, it was due in part to a very specific photo spot that drew us to Wanaka. When we saw pictures of Roys Peak, it occurred to us and we knew that we absolutely had to go there, no matter the adversities. What we mean exactly is 1,200 vertical metres, lots of sweat and one of the most strenuous ascents we’ve done in a long time. 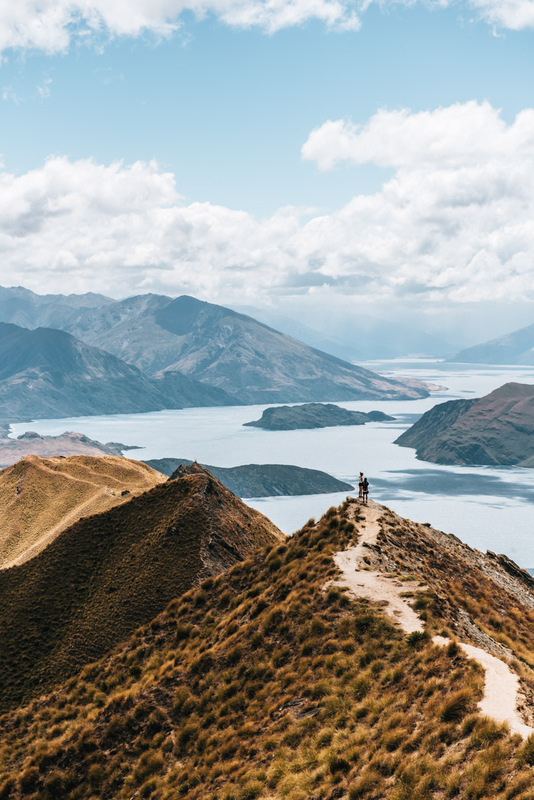 All that effort… why bother hiking up to Roys Peak? Read on and find out why! There’s no question about it, the hike up to Roys Peak is one of the most spectacular but also the most strenuous hikes we’ve ever done. What makes the track so special? 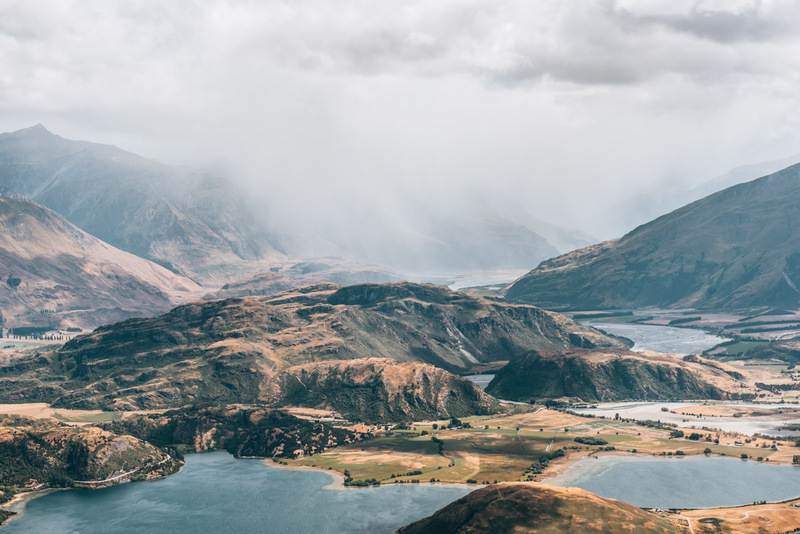 Throughout the tough ascent, you can enjoy magnificent views across Lake Wanaka and the surrounding mountain ranges, including Mount Aspiring. The track quite literally zig zags up the entire way and at a very steady gradient. All in all, you cover 1,200 vertical metres from the car park to the summit of Mount Roy. The route is anything but varied, it’s almost exclusively well-paved the entire way up. For us, the strong wind made the hike particularly exhausting. We had the misfortune that this region had not experienced much rain for weeks, so the track was incredibly dusty. Didn’t help that the wind (or rather wind storm more like) whirled the dry masses up into dust clouds. After about two hours of hiking you will reach the famous Lookout Point. Here, a narrow path meanders along the ridge and creates a picture perfect postcard shot. 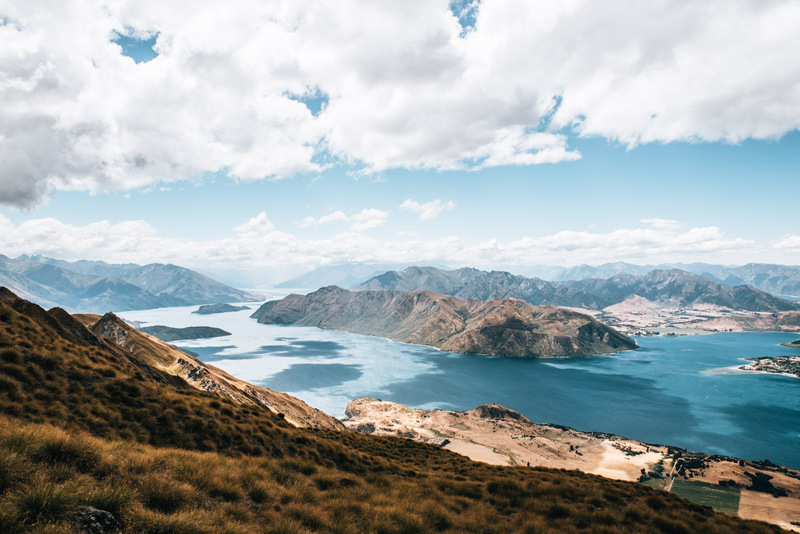 We don’t want to destroy any dreamy illusion you may have of being alone with this beautiful view, but the pictures you see are very misleading – because the chances of being the only ones here is as likely as spotting a wild kiwi bird. It’s pretty crazy and hard to imagine, that just behind this shot is a huge snake line of people all waiting impatiently for their photo turn. After all, everyone wants to have a photo of themselves without other people. We ourselves came during high season (January) and had to wait at least 20 minutes to get these shots. From the lookout/photo point, it is another 30 minutes to the actual summit of Mount Roy at 1578 meters. The way back to the start is the exact same route. Small note: Don’t underestimate the downhill, because you will need enough leg strength to make it back down the mountain. Overall, you will need about 6 hours return including breaks up the top, so be sure to bring enough water and something to eat. At least 1.5L of water per person and depending on the heat, maybe more. There is no way to replenish water on the way, no waterfalls, no taps. In addition, there is hardly any shade on this hike to escape the sun. We were very happy to have had our jackets with us. While it was a warm summer’s day down the valley at the start point, it was unbelievably windy at the top of the mountain and unexpectedly cold. Mid-height trekking shoes are enough as the terrain itself is not that demanding. (Our recommendation: we swear by our Scarpa shoes). And last but not least, don’t forget your sunscreen! Our visit to Roy’s Peak was during the middle of summer in January. In winter (June, July, August) the conditions are very different and you have to be prepared for snow and ice during the winter season and have appropriate Alpine & Safety equipment with you just in case. 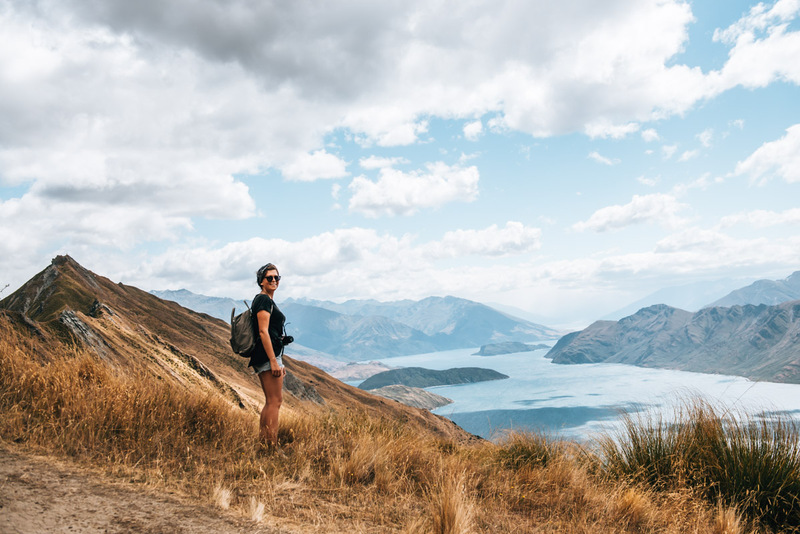 The Roys Peak Track also closes every year between 1st October and 10th November for the lambing season – this entire track is actually private property. The start point is only a few kilometres outside the centre of Wanaka. You can reach the car park in about 10 minutes driving along Mount Aspiring Road to the west. The number of parking spaces is limited. We were advised to be there before 9am but didn’t quite make it until about 10am and we still snatched a spot! The small township of Wanaka is cozy and easy to get around. The tourist bustle that you may have experienced in Queenstown does not exist here. However, that’s not to say there’s not much to do or see in Wanaka – quite the contrary! 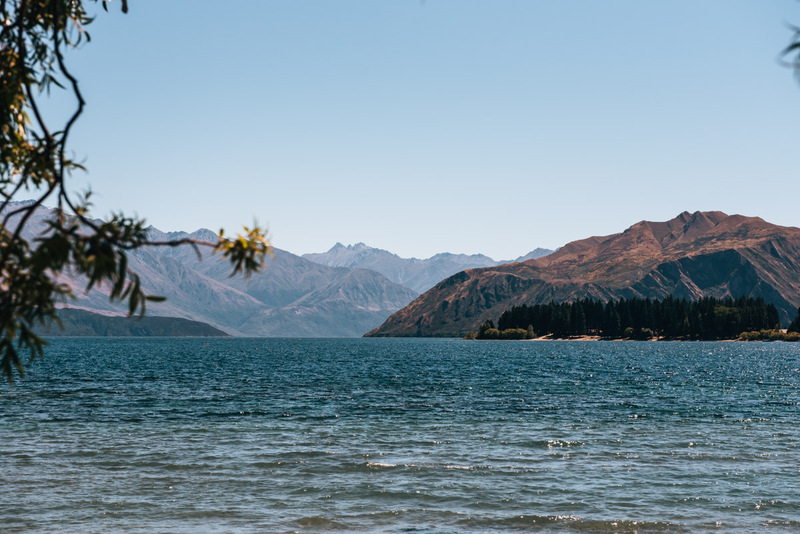 One of the nicest things about Wanaka is of course its idyllic location on the crystal clear waters of Lake Wanaka, which happens to be one of the largest lakes in New Zealand. During our visit in the middle of summer, we got lucky with the water temperature, which was above average and so we were swimming in the lake every day. Along the shore there is a narrow pebbled beach near the town centre with plenty of sunbathing spots and also a few trees providing some shade. 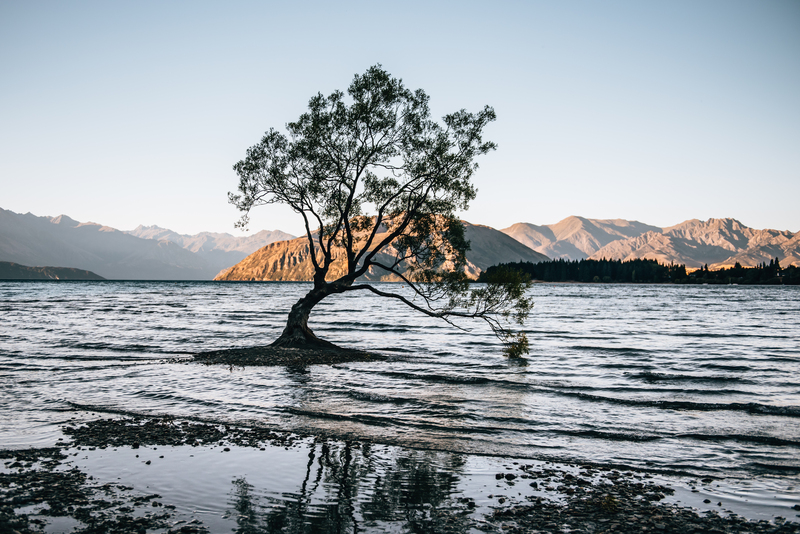 A rather intriguing sight, is the lonely tree which stands not far from shore on the waters of Lake Wanaka. The Wanaka Tree (aka. The Lonely Tree) is certainly the most famous tree in the region and possibly the most photographed tree in the world. Especially at sunrise and sunset, the Wanaka Tree becomes a popular photo destination. Small warning: Be prepared for a mass gathering of what seems like a photography get-to-together with dozens of tripods being waived around for that prime long exposure shot. We ditched our tripod and decided we would rather enjoy the sight than join the craze. From the centre of Wanaka you can reach the Wanaka Tree after a short walk to the west. At sunrise, the light is probably more atmospheric. We came at sunset and unfortunately, the sun had disappeared behind the mountains and the tree was already in the shade. We ate out at “Big Fig” twice in two days because the food was just so ridiculously good. 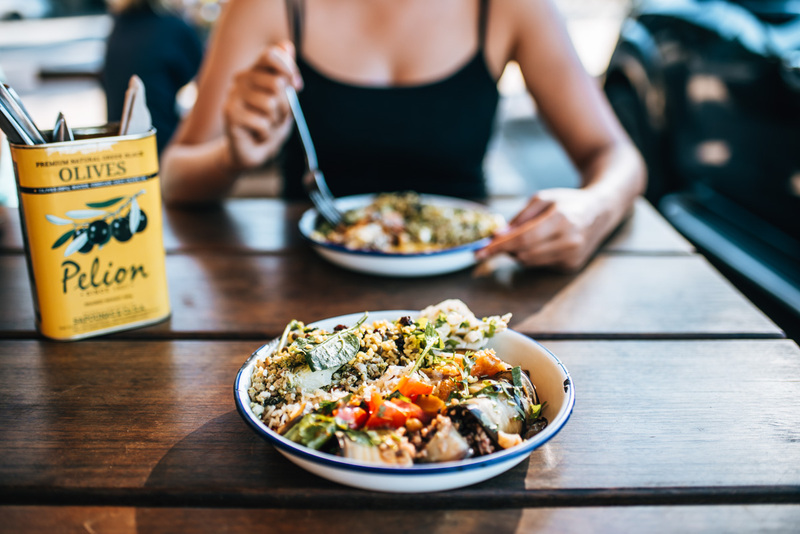 The concept of “Slow food served fast” appealed to us, and the food is both regional and seasonal. You simply choose your plate size (small, medium, large) and then select from the variety of main dishes and salads on display. Once you’ve paid, you can enjoy the delicious food! With a bit of luck, you can even sit outside. Every single dish was excellent. In addition, the prices are rather fair – for New Zealand standards. A medium vegetarian plate costs 15.50 NZD (not even 10 euros). Conclusion: can highly recommend! After having enough of Burger & Co. on our trip, this was a welcomed treat. In Wanaka, we got lucky with accommodation once again. The Wanaka Alpine Lodge is a dream of a place to stay, therefore, we couldn’t help it and exceeded our intended travel budget just a little for these two nights. Our hosts were a New Zealand couple and they opened this luxurious bed and breakfast just outside the town centre. They themselves live on the neighbouring property and rent out just a few rooms. The owner’s attention to detail is something you will notice as soon as you enter the property. The entire area is very well maintained and the room furnishings are of very high quality. One of the best aspects of our stay was the breakfast, which the host herself personally prepares and her husband also aims to ensure the comfort of their guests. In no other accommodation in New Zealand have we had such a delicious breakfast. The lodge also has a very community feel to it, meaning that at breakfast, the host will be present along with the other guests so you can share some nice conversations. 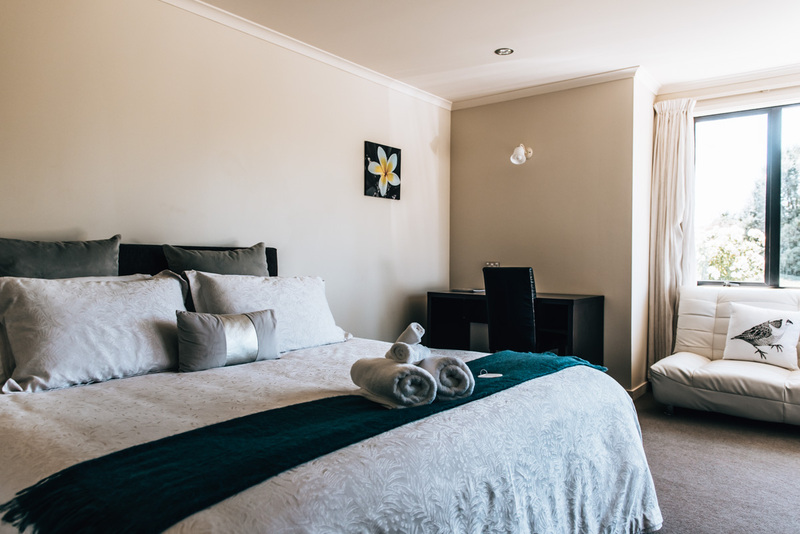 The only drawback is that the Wanaka Alpine Lodge is located about 3 kilometres outside Wanaka town centre. So you are dependent on having a mode of transport. 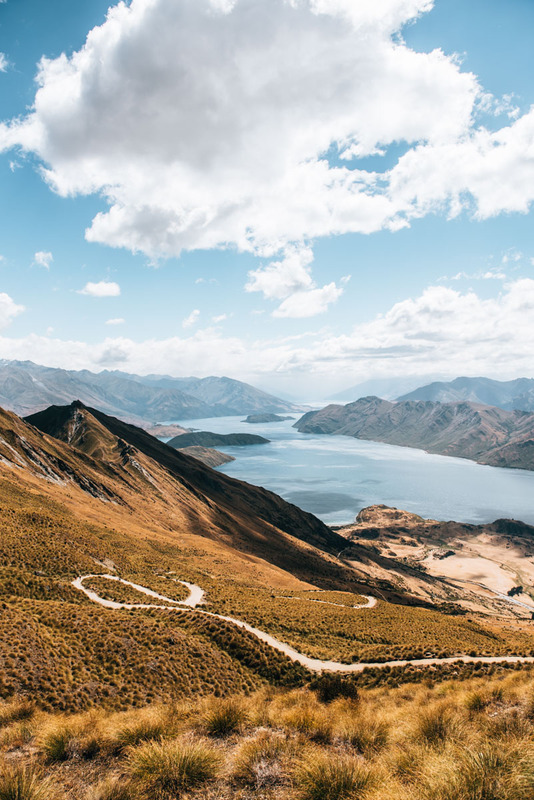 If you have a rental car, that’s probably the best way to do it, plus parking in Wanaka township is pretty easy and plentiful. This blog article contains our personal recommendations in the form of so-called affiliate links. If you book or buy something via the links, we will receive a small commission. For you, this does not change the price one bit. Isn’t that great? A million thanks from both of us! 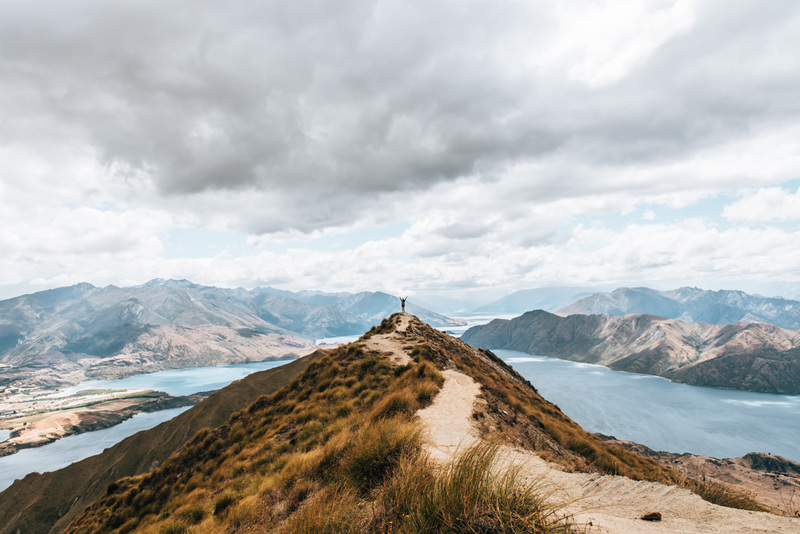 Have you done the hike up to Roys Peak? 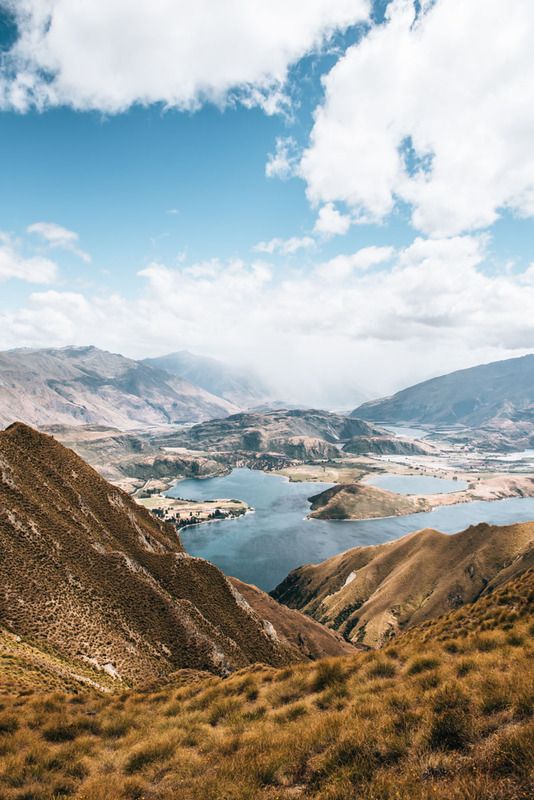 Do you have any further tips for Wanaka or questions for us? 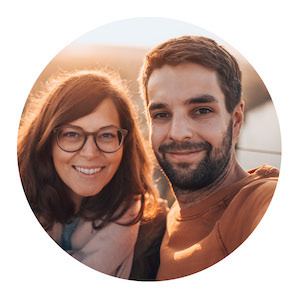 Leave us a comment – we look forward to reading and responding to them!